Craig Rosenberg, the demand gen expert from Focus.com recently asked me to participate in putting together the eBook, The Focus Experts Guide: Sales and Marketing Pipeline and Funnel. With the advent of Social, Sales and Marketing 2.0 techniques and tools, optimized Inbound Marketing strategies, and a much more sophisticated buyer, the days of a funnel are gone. Buyers put themselves in the funnel where they want to be. They jump around. The influence of content and word of mouth jumps them from side to side to back and down again. 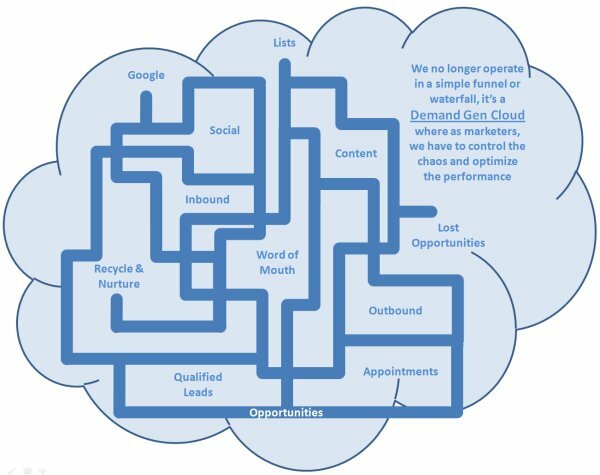 The demand gen funnel is now in the cloud. As marketers, we must constantly measure the status of the cloud and make adjustments. Combine strategies and tactics in order to maximize our results. Harness the chaos to our advantage. Control the Demand Gen Cloud. Sue Hay, CEO of BeWhys Marketing Inc.
Get the eBook here: The Focus Experts Guide: Sales and Marketing Pipeline and Funnel.